You have a choice of various mixers for the wash basin – the single lever mixer even comes in two different heights. All of them typically feature the wide shelf on the top. The free-standing bath tub is combined with the floor-standing Axor Massaud bath mixer, and there are also matching mixers for the bath tub rim. In the shower, the shower mixer and various thermostats constitute an ingenious combination of organic and geometric shapes. The Axor Massaud bathroom is supplemented by matching hand, plate overhead and side showers in clear design. The towel holder becomes a branch, the cosmetics box resembles a pebble, the mirror rests against a bough, and lots of other accessories also invoke a natural look. Wash bowls and built-in wash basins blend in seamlessly with the Axor Massaud basin mixers: the basins are ideally suited for dealing with the characteristic gush spray, minimising splashing as a result. Their warm surface is easy to clean. 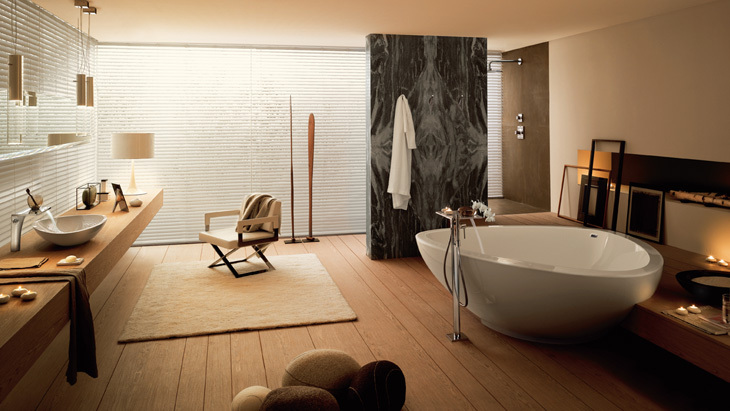 The free-standing bath tub also conforms to the collection's natural design concept, resembling a lake.